Earlier this year we installed our coolship. To say we are excited (and nervous), about this would be something of an understatement! We have dreamed of installing a coolship (or cooler/ cooling tray if you favour UK-centric terminology), since our inception back in 2013 – our first ever brew was a mixed fermentation saison and a coolship was always the logical progression/ dream that we aspired to. 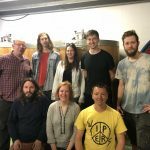 However, the very nature of them means that a fairly large space needs to be devoted to it and space is something we have struggled with here in our location (we are in old farm buildings and the very nature of our beers mean a lot of space is taken up with long term storage). Added to which you can only use it for a few months of the year when the nights are cold enough. 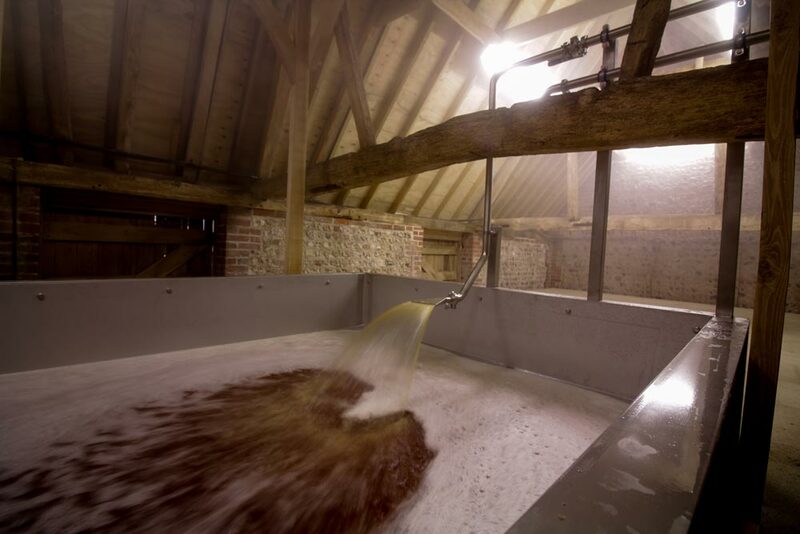 Last year however, we had the opportunity to restore a Grade 2 listed barn and make it a space dedicated for our barrel aged beers and up in the rafters we could site a coolship. With a rough sketch of what was required, we commissioned our friends at Gravity Systems to fabricate this bespoke item. This was not the only item we desired, we had an idea to suspend staves from ‘well seasoned barrels’ over the coolship to encourage innoculation both from wild yeasts and our own mixed fermentation beers. By selecting a few barrels that have seen a fair bit of use, we were confident that the yeast critters were well bedded into the wood, just biding their time until some nice sugary wort presented itself. Across from the brewery is Firle Estates old carpenters yard and here Melanie (who does a fine line in Shepherds huts), created a wonderful oak frame to support the barrel staves, using traditional techniques – not a nail in sight! This, whilst being functional, is a thing of beauty – contrasting with the steel whilst blending well with the beautiful oak roof structure of the barn. Finally on March 16th, we did our first brew into it. Using a high proportion of un-malted wheat and some un-malted heritage grains from a farm close by ( to give the yeasts some complex sugars to eat on during the slow fermentation), we approximated a traditional turbid mash, as used by the lambic producers of Belgium. This involves step mashing, starting with a very thick mash and adding boiling liquor to raise the temperature (thank heavens for the rakes! ), then pulling portions from the mash and boiling them to stop conversion, before adding these back to the mash tun for the run off. Then an extended boil using local hops that we have aged here for two years to keep the preservative qualities with minimal bitterness. All of these processes, which we were new to, were adding up for a long day but finally the time came when we could run the hot wort from the brewhouse to the coolship in the other barn, via a dedicated hard – piping run. Did we all grin? Yes we did! And more so now, as our first attempt at spontaneous fermentation has taken off with plenty of activity in the barrels. With two brews done for this brewing season, we hope to have an idea of where the beer is taking us (and any improvements we can make), before we start again for the 2017/18 season. Then maybe in a couple of years we will have a blend and present you with – we’re in this game for the long run! This project was made possible by funding from the leader project.